Victory Films Marine Fighter Piloy DVD Review by Floyd S. Werner Jr. Conclusion: If you like the Corsair or the SBD stop reading this review and just order the DVD. Let me start by saying if you like the Corsair or the SBD stop reading this review and just order the DVD. The latest offering is a WWII Marine Corps fans dream. The run time is 1 hour and 56 minutes long. There is plenty of previously unreleased material. Filmed in color and b/w the stuff on this DVD will inspire the model builder and historian alike. 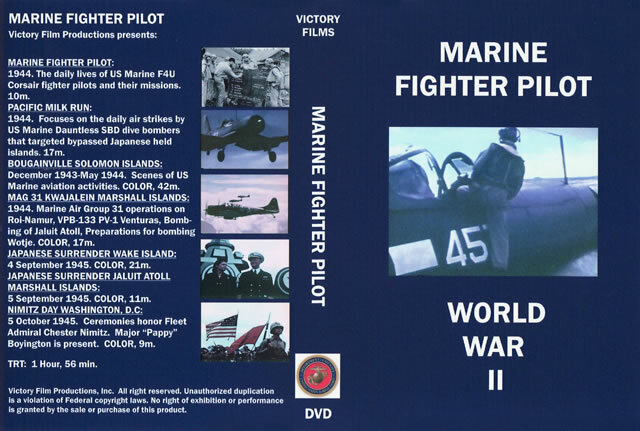 The first part of the DVD is a documentary entitled “Marine Fighter Pilot”. A ten minute black and white film on Corsairs and the pilots planning a mission and the post mission debrief. It is an obvious rah-rah feel good film that was so typical for the period but it is really enjoyable. There are plenty of birdcage Corsairs with lots of gun camera footage thrown in. The next segment is called “Pacific Milk Run”. Another documentary this time featuring B-25s, Avengers, Corsairs, and especially, SBDs. The variations in color and weathering proves that you can’t over weather a Pacific land based aircraft. The SBD is the featured aircraft and if you like them this is a treasure trove for you. I enjoyed the take off sequence where you are treated to a back seater’s view of a formation take off. One thing you will note after everyone is formed up is there is considerable variations in the weathering and US insignia, including one aircraft where they are grayed out. During the attack sequence, you are treated to Ki-27s and a Ki-61 Tony. Bougainville is the feature of the next sequence. From here on out the rest of the DVD is in full color. The sequence starts with a camouflaged Piper Cub taking off. It was interesting to see it in OD and not the ever popular yellow. There are plenty of weathering opportunities for the SBDs and Corsairs. You can’t over weather one of these machines. Some B-24s show lots of different variations in Olive Drab. They have some interesting nose art. Marine and Aussie SBDs are in the next segment. The takeoff in formation is again really interesting. Some of the US Insignia are so weathered that they have white all over. This is as close as most of us will ever get to being there. The maintenance on the SBDs shows diorama possibilities in every frame. Again I’m convinced you can’t over weather. The bomb assembly is interesting. The winching of the bombs was new to me and so ‘archaic’. Some of these shots were used in the Pacific Milk Run but here they are in full color. Kwajalein shows up in the next portion with C-46s and C-47s in maintenance. Corsairs with pin-up nose art, which I’ve never seen before, are shown to great effect in full color. VPB-133’s Lockheed Venturas are highlighted. This chubby looking aircraft is really quite attractive in the three tone scheme. You can see them in take off and in flight. Really interesting stuff. MAG 31 shows life on the Pacific bases. Corsairs abound with variations in the tri-color scheme and the first Gloss Sea Blue aircraft. Brewster racks and drop tanks on Corsairs are seen in flight. The bombing mission is really interesting. A Gloss Sea Blue Corsair with a tri-color drop tank would make a neat model and you would have the reference. The Japanese surrender ceremonies are shown with a typical ceremony on a ship and on land. The best part of this sequence are the Japanese aircraft derelict on the strip. A Zero is shown which is quite grey and not Amer-io. There is either a red primer on the upper surfaces. I thought this was odd but then you are treated to a Nell in the same red upper surface. Japanese aircraft fans will find this especially interesting. The final display is conducted by Helldivers as they bomb the Japanese equipment. They drop the bombs extremely close to the camera man. The final spot highlights Nimitz Day in Washington DC. Nimitz and very briefly Pappy Boyington with his Medal of Honor are shown. The neatest part of this sequence is the fly-by of hundreds of Navy airplanes spelling out NIMITZ. Now that is how you know you are going to go down in history. There are so many segments to this DVD that are in color and feature previously unreleased material that you have to add it to your collection. Also if you like Corsairs and SBDs this DVD is made just for you. I really enjoyed the video. This is the quality typical of the Victory Films DVDs. If you haven’t checked one out, this is a good one to start with, but be careful they are addicting and you can’t just watch one. Thanks to Victory Films for the review copy. You can obtain your copy of this DVD and all the other great titles at Wade Meyers Studio at http://www.wademeyersart.com/id69.html . Let them know I sent you.